Winter ice, snow and winds can cause serious damage to trees. 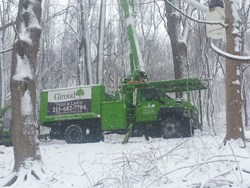 Giroud Tree and Lawn provides tree service tips including hazardous tree removal to help Philadelphia homeowners protect trees and property from damage this winter. Tree service is needed when snow, sleet, ice and wind destroy trees and damage property! The trees most like to be damaged in a storm have not been recently inspected or maintained. As winter roars through Philadelphia, homeowners need to be aware that snow, ice and high winds can cause serious damage to trees. Giroud Tree and Lawn provides tree service tips including hazardous tree removal, homeowners can use to protect trees and property from damage when winter storms strike. 1. Hazard Inspection: Have an ISA Certified Arborist do a root to crown inspection to identify hazards such as cracks, weak limbs, deadwood or unsafe root systems. 2. Tree Removal: Dead trees are a hazard and must be removed. Winter is an especially good time for removals since the ground is hard and there is less risk of damaging understory plants and lawns. 3. Winter Pruning: Two types of pruning are most critical in the winter: deadwood removal and reducing wind resistance. Selectively thinning branches helps the wind to move more easily through the tree and prevents uprooting. However, never thin more than 25% of a tree’s crown at one time. Additionally, dead branches should also be removed since those are the first to break in a storm. 4. Tree Cabling to prevent splitting: Trees with multiple trunks or weakly attached limbs are prime targets for splitting. To successfully secure a tree, use a tree service professional with the knowledge required to select the best cable system for each tree’s specific situation and install it at the right tension and location in the tree. 5. Shake Ice and Snow off shrubs and small trees: Use a long pole or rake to gently lift branches and dislodge snow or ice. The heavy weight can cause trees and shrubs to break or split. Bradford Pears, Birches, White Pines and Arbor Vitae are most at risk. 1. Is the tree service representative an ISA Certified Arborist. The ISA, International Society of Arboriculture, is the professional association of the tree care industry. 2. Tree service companies are traditionally slower in the winter and as a result pricing is often at its most competitive level. “Together, both factors make a winning combination for homeowners and trees,” concludes Mr. Giroud. Giroud Tree and Lawn specializes in tree service, tree removal and lawn care programs that make customers love doing business with the company since 1974. Serving Bucks, Montgomery and Philadelphia Counties, the company offers professional tree and lawn evaluation, tree pruning, tree removal, insect and disease control, fertilizing, stump removal and traditional and 100% organic lawn programs to keep lawns healthy and green. Giroud Arborists are certified by the International Society of Arboriculture (ISA) and have the knowledge and experience required to properly diagnose, treat and maintain trees and lawn health. The company has been awarded the Angie's List Super Service Award® every year since 2005. The “Giroud Treework for Charity” program donates free tree care services to parks, historical sites and other non-profit organizations located in the Company’s service area. For more information, visit the company website at http://www.giroudtree.com or call 215-682-7704. Winter ChecklistUse Giroud's Winter Checklist to prepare your property for anything this winter!